Kojo Senoo/Pipe Dream Photographer A severe blockage caused leaks in various rooms of the basement and first floor of University Union West on Saturday afternoon. 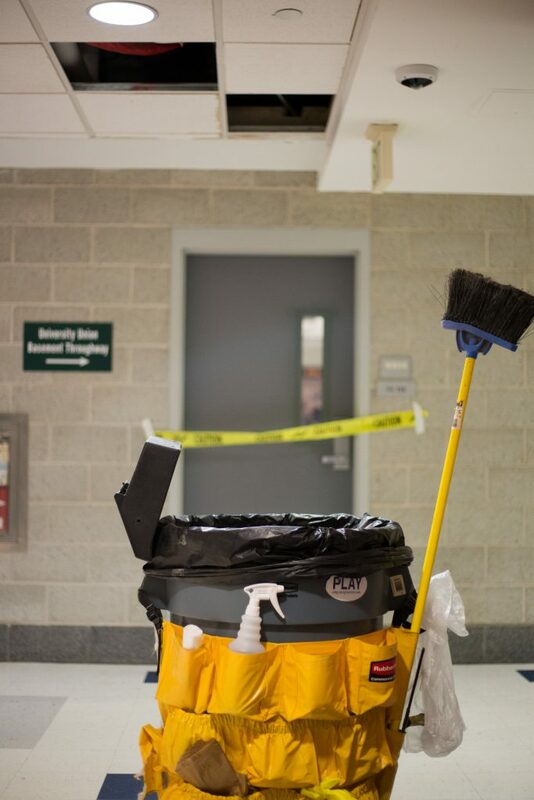 Due to a large sanitary backup in the University Union, multiple student organizations were affected by leaks in their offices on Saturday afternoon. According to Michael Kukawa, director of operations and construction for Physical Facilities, 11 rooms were affected by the backup, with nine offices in the basement and two rooms on the first floor seeing leaks. After responding to reports of leakage, Physical Facilities, the department in charge of maintaining, operating and protecting the University’s buildings, roads and grounds, was able to determine the root cause of the backup — a blockage in the six-inch house trap for University Union West. According to Kukawa, the blockage was made up of rust and scale that had accumulated in the trap. The damage from the leakage varied by room, with some organizations affected more heavily than others. Michael Morganti, president of Binghamton Television (BTV) and a senior double-majoring in geography and cinema, said the leak caused significant damage to BTV’s studio, with a large amount of their production equipment contaminated by the leak. However, other organizations, such as SA Ink, did not see much damage. Jessica Zhao, a printing clerk for SA Ink and a senior majoring in accounting, said while there was a leak in their office, SA Ink’s printing equipment was not impacted. According to Kukawa, Physical Facilities removed wet drywall and ceiling tiles from the rooms affected by the leakage to avoid mold and other issues. Humidifiers were also placed in some rooms to help speed up the drying process. Because of the leaks, the Marketplace also briefly closed Gardentoss and Moghul on Saturday, according to Thomas LaSarso, general manager of retail operations for Sodexo at Binghamton University. No other areas of the Marketplace were affected. According to Morganti, the leak was well handled by Physical Facilities immediately after it happened, but he said it was disappointing that the leak occurred in the first place.